"This is a 'to-die-for' tangy lemon tart. Family and friends always request it when invited for dinner." Place flour, butter, and confectioners' sugar in food processor; process until mixture resembles bread crumbs. Add egg yolk and 1 to 2 tablespoons cold water, and process until mixture forms a dough. Mold dough into 2 flat shapes, wrap in plastic wrap, and chill for 20 minutes. Bake until the tart is nearly set, about 20 minutes. The filling will be runny in the center, and will set when cool; don't over cook, or cracks will appear. Cool and serve. This recipe makes two dough crusts. Freeze remaining crust for another time. Very nice and tangy went down a treat with the family. Would make again. 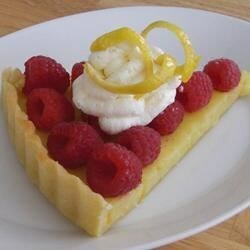 There is only one bad thing about this Recipe you need to make sure you have guests over so you don't eat the whole tart yourself its purfect the pastry is just sweet enough to balance the lemon.